Fern Canyon was another one of my favorites from this trip, mainly because I had never seen a canyon/gorge like this before. 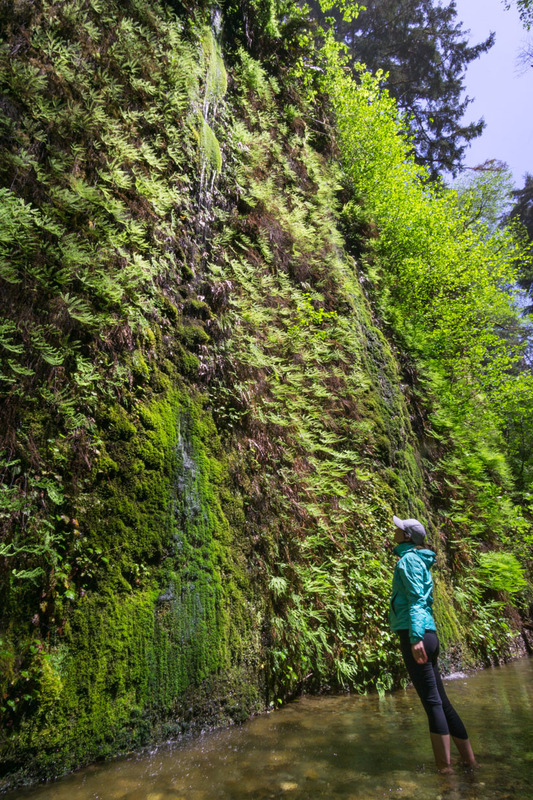 Located at the end of a rough dirt road, this hike is one of the most popular stops in the Redwoods Parks system, and it was even the filming location of Jurassic Park due to the many different types of ferns that completely cover the 50 foot walls. To get here, you'll need to take the narrow and windy Davidson Road to the entrance station (8$ for day use). It's another 3 miles on a dirt road with tons of potholes and possible creek crossings. I was nervous how my sedan would handle the first crossing, which was the deepest and largest, but I was fine crossing towards outlet side of the pool, and there were plenty of other sedans at the lot. You'll pass by Gold Bluffs Campground (which I made a mental note to come back for since it looked like a great place to camp) until the road ends at a large dirt parking area. There is a vault toilet here, and expect steady streams of hikers and groups coming and leaving, especially on busy weekends. The trail starts off along the grassy open areas with views of the beach in the distance. Keep an eye out for any elk that might be in the area. It's a pleasant 0.24 miles from the parking lot among the trees until you get to the start of the canyon. Once you reach the creek, head upstream into the canyon. There are no signs marking the entrance, but just know not to continue heading up the James Irvine Trail, which actually is one of the best redwood hikes in the world. There used to be seasonal footbridges, but it seemed like the canyon took a beating from the rough winter storms in 2016 as there was a lot of debris. In the summer/autumn you might be able to keep your feet dry in the canyon, but since it was spring we just hiked directly in the creek, and the water never was deeper than our knees anywhere. The canyon is short with only a couple turns, but you will eventually reach the large log jam. Feel free to continue past this, but the canyon begins to open up and the ferns are not as dense up the canyon. While driving back, keep an eye out for Roosevelt Elk - Prairie Creek has lots of opportunities and viewing areas to see these herds. I encountered a large herd right by the 101 freeway shortly after leaving the Prairie Creek park. They seem quite used to people, several passing cars stopped to get out within 5 feet of them to take some photos.